CYBER CLEAN® is the revolution in cleaning agents! It removes dirt and gets rid of germs. Hygenically clean tight spaces and deep grooves, even where normal cleaning agents fail! Rid all surfaces of dirt, fungi and bacteria. Ideal for cleaning of electrical devies such as telephones, keyboards, cell phones, remote controls, digital camera and much more. Absorbs dirt and dust! Regular use of CYBER CLEAN significantly reduces the risk of infection with germs, viruses and bacteria. 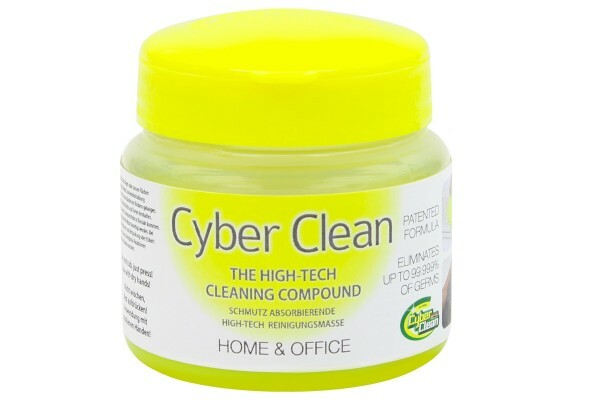 CYBER CLEAN was tested for effectiveness and function in accredited international laboratories. More information on this can be found in the test reports! Absorbs dirt and dust from all creases and surfaces.